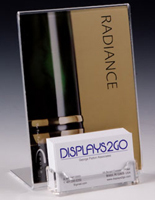 These product pamphlet displays are the perfect all-in-one presentation solutions for printed materials. 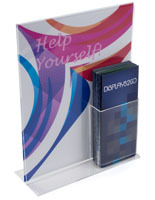 Each flyer holder features a built-in sign frame that doubles the impact of advertisements. 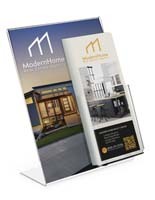 The pamphlet displays, also called literature or brochure holders, are great for distributing important product spec sheets and company information. 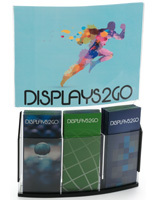 In fact, the leaflet pockets are commonly used at retail stores, trade show events, and business offices. 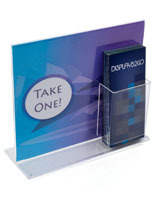 What makes these pamphlet displays so practical? 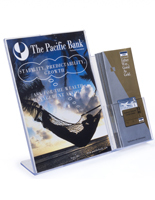 The dual-purpose design features a combination of a sign frame with a slot for brochures, which significantly increases the exposure a company can get. 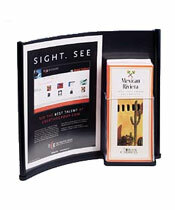 Some of the literature distribution systems come equipped with just a single pocket while others include multiple compartments. 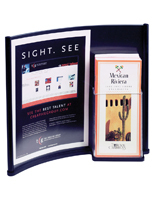 Take a look through the vast line to find the brochure pocket frame most appropriate for your store or office. 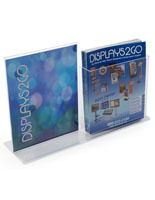 Which plastic brochure holders with sign frames are most popular? 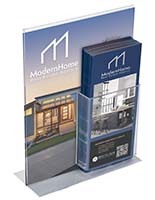 Although all of our pamphlet displays boast exceptional quality and unbeatably low price tags, certain designs are favored by customers. 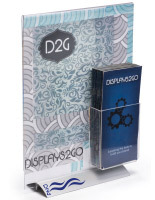 The angled leaflet displays with frames are great for retail locations and professional offices alike. The slanted framing ensures that onlookers always have an easy time viewing the displayed signage. 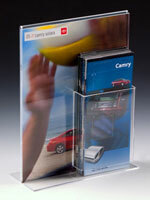 Most of the flyer dispensers have a fold-over assembly that allows the user to effortlessly slide signs in or out. 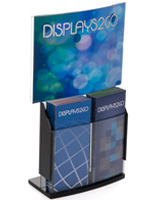 Vertical sign displays with brochure pockets are another fantastic choice. 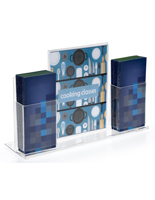 The frame on these types keeps signage showcased prevalently at 90 degrees from the tabletop. 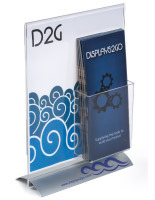 Many professionals choose these brochure holders when more visibility is required. 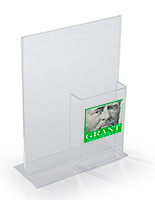 There are also curved flyer holders that feature either concave or convex faces. The added style is great for modern stores and offices. 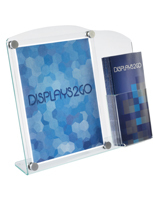 Some of these plastic and acrylic frames come equipped with two or more pockets, which make them highly functional for busy establishments. Are there any other important traits of the leaflet displays to consider when making purchase? When buying a pamphlet rack, the customer should think about what kind of sign will be displayed. Size is an obvious facet of the framing. Most of the designs fit standard letterhead sized materials. 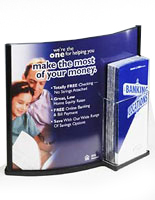 8-1/2" x 11" advertisements are very common especially because many retailers print out their own promotional signs from an office computer and printer. 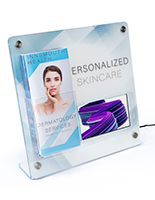 This type of configuration not only allows for easy sign customization, but also makes updating information much easier. The orientation and layout of the sign frame should also be considered. 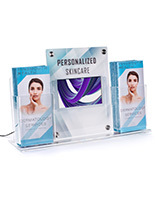 There are models that have the pocket or pockets covering a portion of the display frame as well as units that do not conceal any part of the signage. In addition, some of the sign frames are vertically formatted while others hold horizontal graphics. Companies and corporations use much of their budgets on advertising. Why not order the proper tools for the job? These dual-purpose pockets kill two birds with one stone, so customers can conserve their limited funds while doubling their advertising impact. 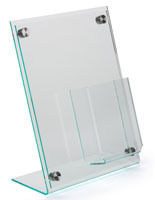 Make a splash at any event by setting up the angled frame that features sign standoff screw covers. Or, save money by purchasing a lower cost unit in bulk quantities. Large businesses are able to equip their entire locations with a single batch order simply because the prices are so competitive and manageable. 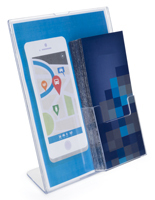 These signage frames with attached brochure holders are ideal for displaying your marketing materials and leaving literature out for customers. That way, they can take home the additional reading materials, such as tri-fold literature, for reference later on. 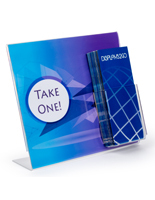 Research has proven that customers are much more likely to remember and come to a company if they have been supplied with pamphlets, flyers, brochures, and other tri-fold publications.